For at least a year, Nina Pakhomova, a Russian mathematician and IT specialist, received job offers from a U.S. tech outfit that had become familiar with her work through the St. Petersburg company they had hired. The offers, however, failed to persuade her. The Bay Area, she concluded during work trips here, was simply too expensive. In 2014, she was in the United States working on an assignment for her Russian employer when anti-Russian sanctions triggered an economic meltdown back home, a day that came to be known as Black Tuesday. Suddenly, her ruble allowance became worthless. A $10 lunch, the rough equivalent of 300 rubles, jumped to 800 rubles by the end of the week. For the first time, Pakhomova and her husband, a software engineer, began to consider the unthinkable: They would become immigrants. Today, Pakhomova works for Uber and her husband works for Airbnb. Together, they make in a year more than an ordinary Russian family will earn in a lifetime. While that may be true, Pakhomova and her husband have much in common with a new wave of Russian immigration to San Francisco and the Bay Area. Like the Pakhomovs, they are young, well-educated, often work in tech, and have more in common with other newcomers than they do with earlier Russian immigrants, many of whom settled in the Richmond District. In earlier waves of immigration, families left en masse. First, after the 1917 Russian Revolution and again in the 1970s and 1980s when, over several decades, some 400,000 Russian Jewish families immigrated to the United States. By the end of the 1990s, the Bay Area had nearly 75,000 Russian immigrants and the Richmond’s commercial corridor had Russian bakeries, restaurants and a Russian Orthodox church. The Holy Virgin Cathedral in the Richmond district is one of the biggest Russian Orthodox churches on the West Coast. Photo by Aksaule Alzhan. Today’s Russian immigrants are not fleeing religious persecution. Instead, like Pakhomova and her husband, the country’s economic instability triggered their decisions. In other cases, they are simply looking for an opportunity in a U.S. economy hungry for their math and IT skills. Some come with visas procured by their employers. Others marry Americans. And others come on student and tourist visas, overstay and then manage to get sponsored by tech companies. Reporting on immigration trends takes feet on the ground. Support Mission Local today. 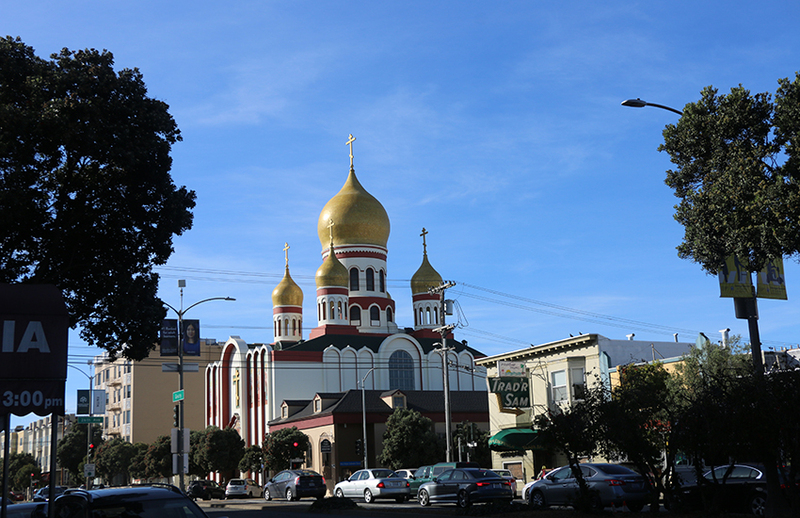 Nowadays, Russian immigrants no longer settle in the Richmond, but live in the Mission, SoMa, downtown or in Silicon Valley. Pakhomova and her husband live in a three-bedroom apartment in San Mateo. Even Russian businesses have taken note of the spreading population. Cinderella Bakery, a Russian bakery in the Richmond, will soon open a new bakery on 24th Street in the Mission. Cinderella’s owner, Mike Fishman, came to San Francisco 31 years ago and has been working “day and night” to sustain his business. Fishman said few places in San Francisco fit the criteria of a classic bakery, but he found one in Mission. The number of Eastern Europeans in the Mission has jumped from 1.3 percent of the Mission’s population to 2.7 percent of the foreign-born population. It was trendy and modern offices like Uber’s that motivated 22-year-old Maxim Bashminov from Stavropol, a small city near Chechnya in Russia, to apply to a Community College in Fremont. Bashminov came in as a J-1 visa holder with the program “Work and travel” in 2006, and stayed. Later, after the instability in Chechnya sparked riots in Stavropol, Bashminov became a refugee. Now, he is a U.S. citizen. Early on after his arrival, Bashminov delivered pizzas — many times to tech companies. The guys who ate them looked just like him, only they worked in the gleaming offices of Silicon Valley while he worked at a pizza place, where he earned $10 an hour. That was 2008, and after two years at the community college, he applied to transfer to the University of California at Berkeley’s computer sciences program. The university accepted him with a full scholarship. After graduation, Bashminov began working in small startups and he still remembers feeling giddy over his first tech salary of $80,000 a year. Like the ambitious young man that he is, he recalibrated his goals. “I quickly realized, that it’s not enough,” he said. Now Bashminov is working for a company that monitors website user data for different companies. 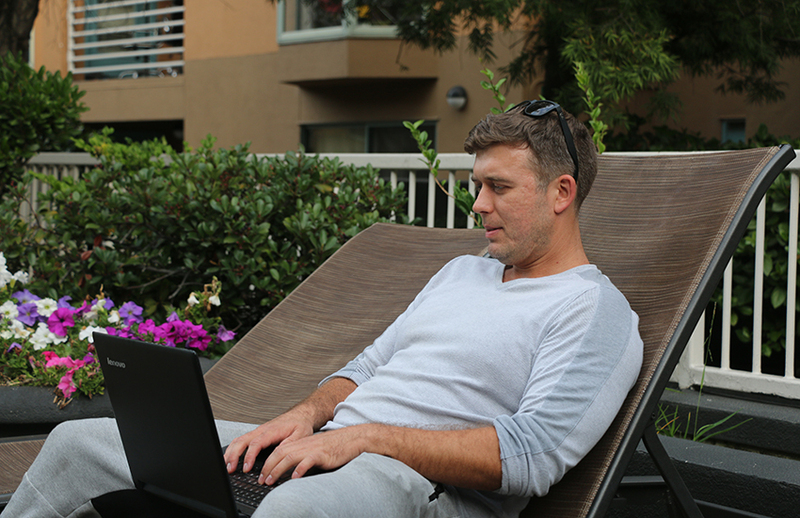 He returned from a vacation in Dubai last week, and before that, he spent time in Miami, working remotely from South Beach. Bashminov’s profile is not unusual. 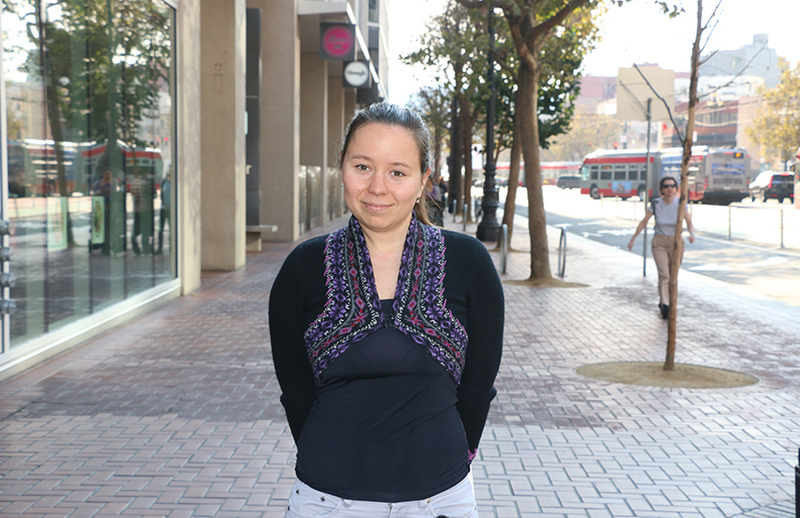 Besides high-skilled programmers like Pakhomova being recruited by big companies, a significant portion of the new Russian immigrants in the Bay Area are people who took advantage of opportunities for education and new training. Most, like Bashminov, had non-tech jobs in Russia, but managed to get to the United States on tourist or student visas and then stayed, some applying for political asylum, others marrying Americans. Alina Vologodskaya, a former journalist and diplomatic worker, married a Russian-American man whose family was part of an earlier generation of immigrants. She now does a wide range of jobs in her husband’s tech firm — from personal assistant to business development. Originally from a small town in Kazakhstan, Vologodskaya worked in Moscow and St. Petersburg before coming to the U.S. after the 2014 economic crisis. She arrived at ExxonMobil in Texas, with an assignment to teach Russian to the company’s workers who were slated for a future project in Siberia. But once the crisis hit, the company stopped the project. Alina Vologodskaya works in the Yerba-Buena gardens near SoMa, where her office is. Photo by Aksaule Alzhan. Nevertheless, Vologodskaya stayed, traveling to Boston, where she eventually met her husband. There is no data on the number of new immigrants that have arrived since 2014, but everyone in the community agrees that the year marked a turning point. While tighter U.S. immigration controls means the number will never reach the heights of the previous centuries, there is an undeniable new generation of Russian immigrants. A classic Russian-looking young woman, Vologodskaya wears heels, fancy jewelry, and her makeup is thoroughly applied. Like other young Russians, she enjoys talking business. She willingly shares the achievements of her technology consulting firm, Convasis. They’ve just finished a project in Africa, a collaboration with the Gates Foundation, and they are now working with another nonprofit. Her husband, Alexei Ossikin, is the son of Russian immigrants, born in Russia but raised in the United States. A Babson College graduate, he got into programming when he was 14. Just because they don’t live in the Richmond doesn’t mean they have fully assimilated. New Russian immigrants acknowledge that their friends tend to speak Russian and be young, successful and new immigrants like themselves. Vologodskaya is a member of “Supergirls” and “Femigrants,” closed social-media-based groups where women — married or single, professionals or housewives, older or younger — organize events and spend time at house barbecues. It’s not uncommon to see them at Lister Bar in Merced Heights speaking Russian, knocking back shots of vodka and playing games. Young Russian men can find American women just as intimidating. Young Russian immigrants are more open to liberal values, whereas their parents, even if they have spent a lot of time in the United States, tend to be more conservative. Kulin’s parents came to the country in the mid-1990s. It has been more than 20 years, he said, but there is no cultural and political difference between his parents and any elderly couple in a Russian province. “I work 24/7 to be good,” says businessman Steve Kulin. Photo by Aksaule Alzhan. “If my child were gay, I would be okay with it. I would love and respect him anyway, but my parents would not,” said Kulin. Kulin and his neighbor, Yelena Yanchur, are among the few young immigrants who are not in tech. They live in a residential complex in a prestigious neighborhood just around the bend from the Embarcadero. An IT projects manager for Sephora, Ulya Antonova and her husband, now a Google software engineer, moved to the United States this year — winners of the so-called Green Card Lottery. Before, they were living in Finland and working in tech. “It was my husband’s idea to apply for the Green Card. It was a spontaneous decision. Honestly, we were not expecting the positive results,” she said. But once they won, they didn’t hesitate. It was, she said, a once-in-a-lifetime opportunity. Yes, you can code in Russia, Antonova says, but foreign companies pay more. If her Russian peers can’t make it to Silicon Valley, she said, they find work in The Netherlands, Finland, Latvia and Canada. Some, she added, work remotely in places like Bali for an American company and earning an American salary. Here, she said, they steer clear of politics. 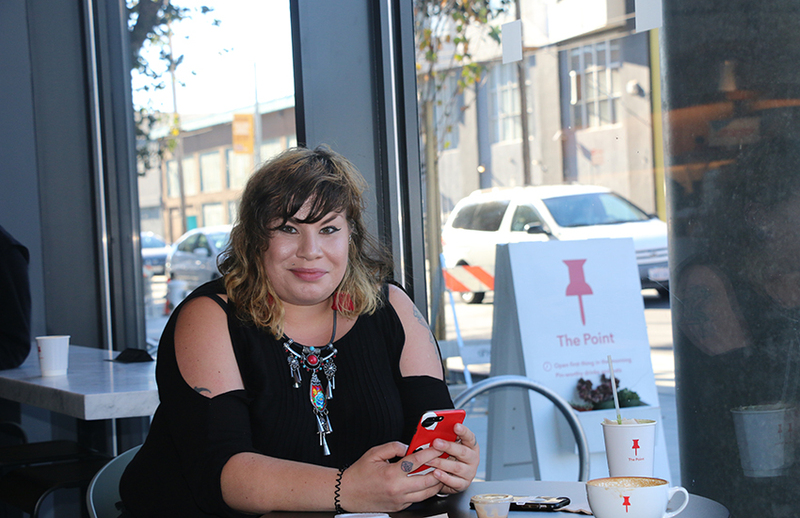 Yuliya Goldman came to San Francisco 10 years ago with $1,000 in her pocket. Already she’s had a son, purchased a two-bedroom apartment in Mission Bay and brought her mom from the Northern Caucasus to help with childcare. Photo by Aksaule Alzhan. Goldman came to San Francisco 10 years ago with $1,000 in her pocket. In that time, she’s had a son, purchased a two-bedroom apartment in Mission Bay and brought her mom from the Northern Caucasus to help with childcare. Goldman, like most of her peers, voted for Democrats in the last elections while many in the elderly Russian community prefer Trump. That conservative strain is still evident in the Russian-language papers. Before the November election, Russian language papers in San Francisco compared the Democratic Party with the Communist Regime and called on Russian immigrants to vote Republican. NextIt took nearly five years for these Mission residents to move back home after a fire. Consider them lucky. What a great great story. Yet another reason to read and support mission local. Very nice summary about the new trends in Russian and former Soviet ex-pat settlement, and even learned some new things about my ahem community. Mostly very good reporting, but please correct the misstatement “former Russian republic” — you meant former Soviet. There were 15 of those, mind you. Thanks. – a Russian speaker in my 30s, immigrated to the US in ’97 (yep, that old wave) and living in Mission Bay.